One thing I was certainly looking forward to was the full Israeli breakfast that you get at the Kibbutz Hotel! The standard Israeli breakfast always includes salads and vegetables, eggs, cereals and drinks, but here they also have other additions such as pancakes and even pizza! Noam tried the pizza but did not like it. Perhaps the first time he met a pizza that he did not like. Avi filled up on pancakes with chocolate sauce. Shayna, of course eats everything! Later in the day, Avi asked if we will get the big breakfast again and he was very happy when I said yes, and sad that we won’t have it again this trip. After breakfast we went to Tel Dan Nature Reserve. Here we saw one of the tributaries of the Jordan, called the Dan River. It was quite beautiful. We also saw the excavated ruins of the ancient Israelite city of Dan, including one of the two alters built by Jeroboam in the book of Kings. 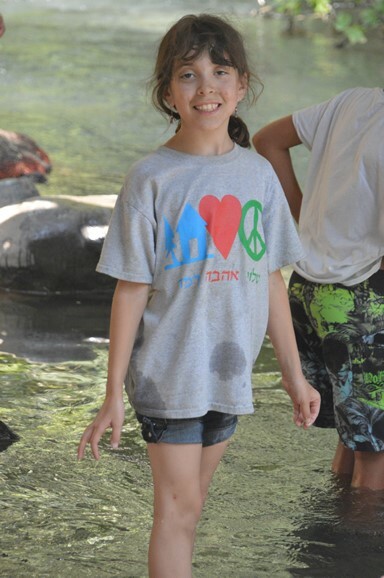 After Tel Dan, we went ATV riding! This was a definite highlight of the trip and all three kids loved it! Shayna was very apprehensive at first, but she was laughing and having a blast over the bumps in the road. This was a great company, because I got to drive the vehicle (sort of a cross between a jeep and a traditional American ATV). We drove up to the edge of the Golan and looked out over the Hula valley and some of the Syrian bunkers sitting on top of the ridge. I know the kids learned something because when David would ask questions later, they knew the answers. At the end of the trip we stopped at the Banyas River, one of the other tributaries of the Jordan. Getting ready for our ATV ride. Noam is in the back hiding as usual. 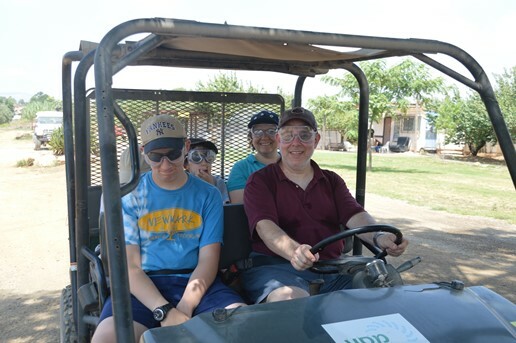 After ATVing, Marsha and I got to make a quick stop at Kibbutz Naot Mordechai. Some of you might recognize the first name in the Kibbutz. This is the Kibbutz where all of the Naot shoes are made. They have an outlet there, and I found very comfy sandals for an amazing bargain. We then made our way to Katrin were we saw a great multimedia presentation about the Golan Heights and saw an incredible scale model of the entire Golan. It turns out that right around the corner from the movie location was the Golan Heights Winery, and David’s brother-in-law is a production manager there! He gave us a quick tour and then we got to have a nice taste of a few of their wines. I wish we could take home many bottles, but we only purchased two. After dinner it was back to the hotel to clean off from the day (the ATV rides made us all very dirty). Tomorrow we will see Tzfat and Haifa and then back to Jerusalem.